Our Standard Ionizer has a 2 inch diameter transparent charging chamber of food grade PVC. Controller box has self-cleaning alternating polarity, constant current, in robust, water-proofed aluminium box, with power level control knob (10 levels), no meter or window. All of our ionizers have internationally approved supply of 24 volts (to overcome problem of non-conductive water), continuous power control over 10 levels, high frequency pulsed DC (enhances ionization) with 50 nanosecond transition rise-time, alternating switched polarity self-cleaning of electrodes, constant current (prevents burn-out of electrodes when water is very hard and electrically conductive, mounted in robust water-proofed aluminium box.Our water ionizers have two similar electrodes of copper/silver alloy (pure silver for drinking water is an extra option). There is good evidence that most ionizers on the market can now be considered to be obsolete in the context of what we are offering as standard features. Our choice of the high voltage of 24 volts necessary when the water is relatively soft, pure and devoid of minerals (low TDS) which renders the water electrically non-conductive. All Biophysica’s ionizers have the following characteristics. Each model is pre-programmed for the chosen power level. Notes: The basic CS-2000: Ionizer does not include electrodes, ceramic ring magnet or UV lights. These options can be added according to your requirements. Our most common configuration is shown above. INPUT FREQUENCY: 50 TO 60 HERTZ to our supplied international switching power supply. OUTPUT VOLTAGE: Controllable and Adjustable by the user from 0 to 48 VDC for Precise control of Ion Production. 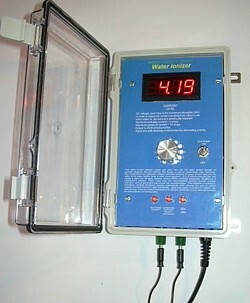 High 24 voltage is needed to combat low conductivity, pure water. OUTPUT CURRENT: 13 models from 0.6 to 20 amps with user variable fine control from 0 to maximum. CURRENT STABILITY: Current is independent of load and will not overload with highly conductive salt water or short circuit. FLOW RATE: 20 TO 120 GPM through 2” diameter cell chamber. CELL REPLACEMENT: Hand tight union threaded cap contains two replacement electrodes for easy removal of electrodes. AUTO-REVERSING POLARITY: Solid State Electronic Switching Circuitry with Automatic Sequential Alternating Polarity Switching for self-cleaning and balanced wear on Electrodes. INDICATOR DISPLAY LIGHTS: Light Emitting Diodes Display Input Power, Cell Power, and Polarity. TEMPERATURE LIMITS: 32 F (0 C) min. to 120 F degrees max. SAFETY & FIRE PROTECTION: automatic resettable solid-state fuse, lightning protection, metal box cannot burn. STANDARDS: Meets or Exceeds UL, CSA and NSF Standards. WARRANTY: Two years on manufacturing defects.